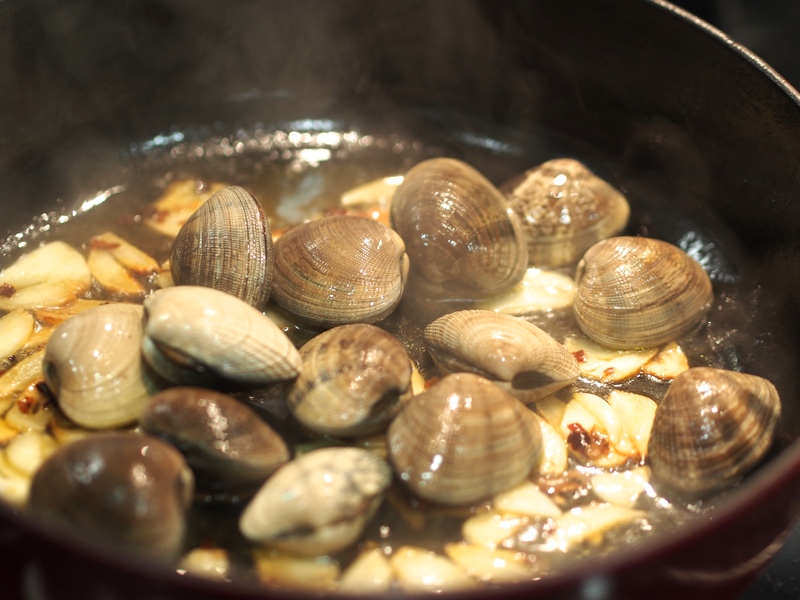 Cooking clams used to scare me because, well, they’re in a shell and I can’t see what I’m cooking! But after I made this for the first time, I was instantly hooked to how easy they are to cook and the fresh sweetness they bring to the dish. 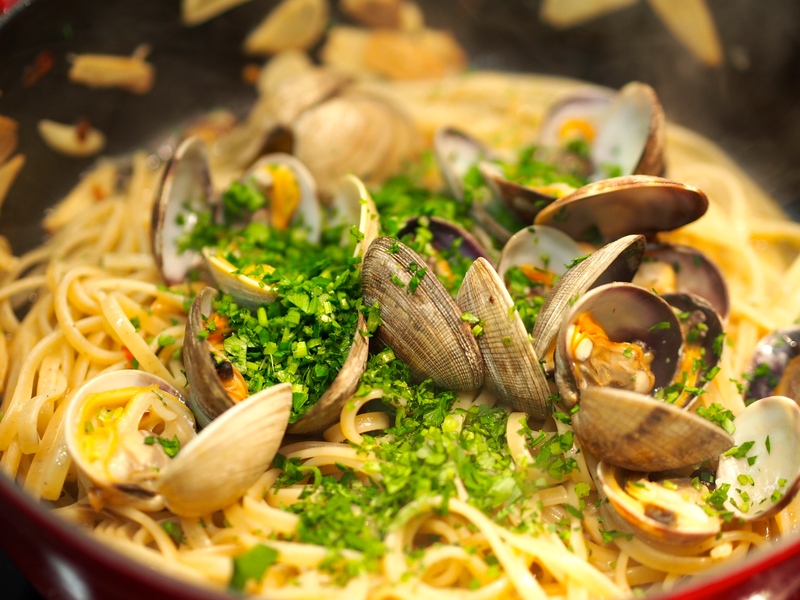 There are only a few simple rules you have to remember to cook clams perfectly. 1, Soak them in salted water to make them spit out sand; they are filter eaters and accumulate a lot of junk inside their guts. 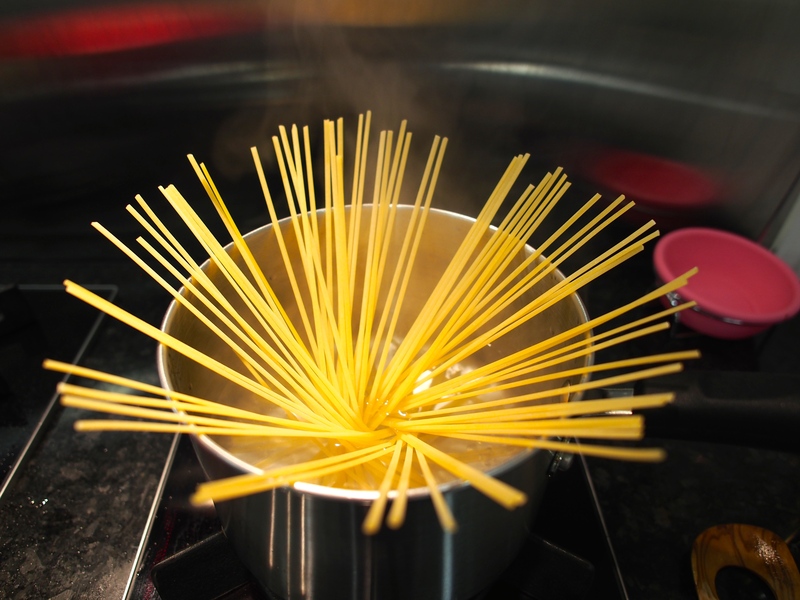 2, Always put the lid on to steam them when cooking to ensure even cooking. 3, Once their shell pops open to 90 degrees (medium heat: 2-3 minutes), they are fully cooked and should be removed from the heat; cook any longer and they get dry and tough. 4. If they don’t open within 5 minutes, discard them because they were already dead and not fresh to eat. Tips for shopping for clams: My favourite place is City’Super because they have a great selection and staff are so patient. I usually ask them to help me pick smaller sized clams (so I don’t lose so much weight in the shell) and only those that have a partially open shell as if the clam inside were reaching out to feed from the water. Don’t buy any with chipped shells. Out of all the times I bought from City’Super, only one clam was dead when I cooked it. Lastly, once you bring them home make it a habit to immediately soak them in salted water so you can cook them whenever you’re ready. 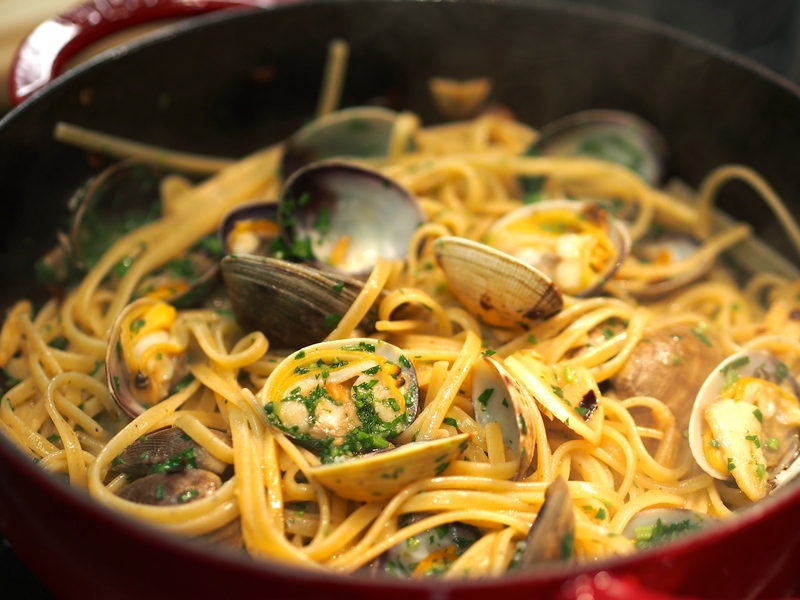 BTW, It is so fun to hear those shells go *clink clink clink* when they open in the pan and to open the lid to these plump clams nestled inside a beautiful pair of shells! Give it a try yourself! 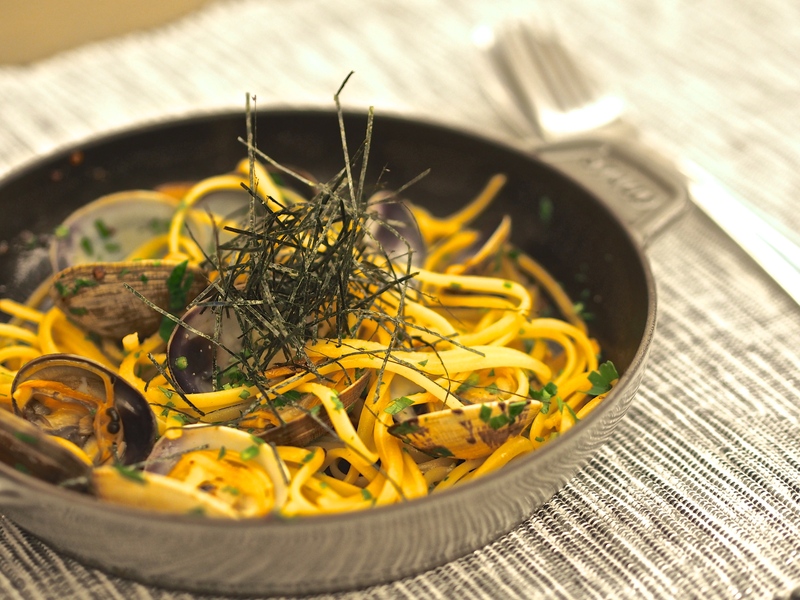 I really believe less is more when it comes to this dish, I have tried using tsuyu sauce, Szechuan peppercorns, oba leaves, and they overpowered the sweetness of the clams. You can use Sake and seaweed to go a little Japanese as I have here or stick with the original Italian version and use a dry white wine. 1. 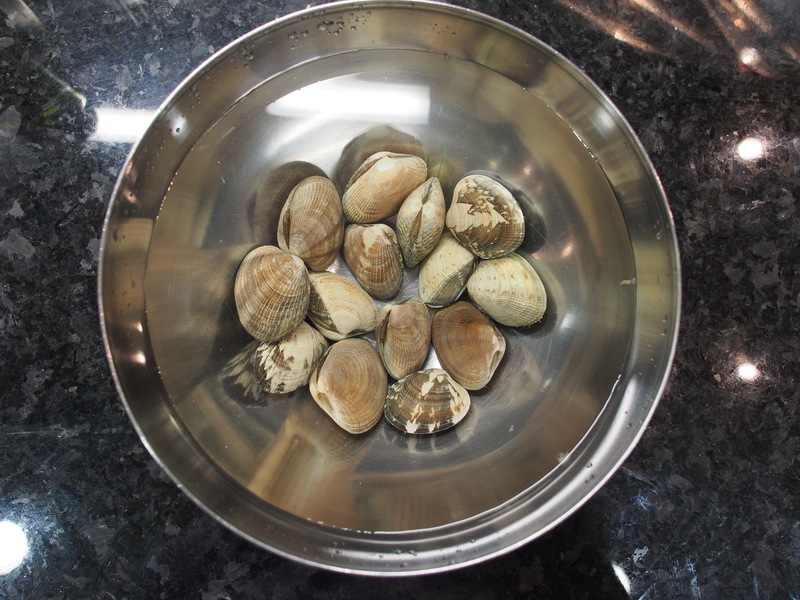 Soak the clams in a large bowl of water with 1 teaspoon of salt and leave in a dark cool place for 1 hour or leave overnight in the fridge. Scrub and rinse. 2. 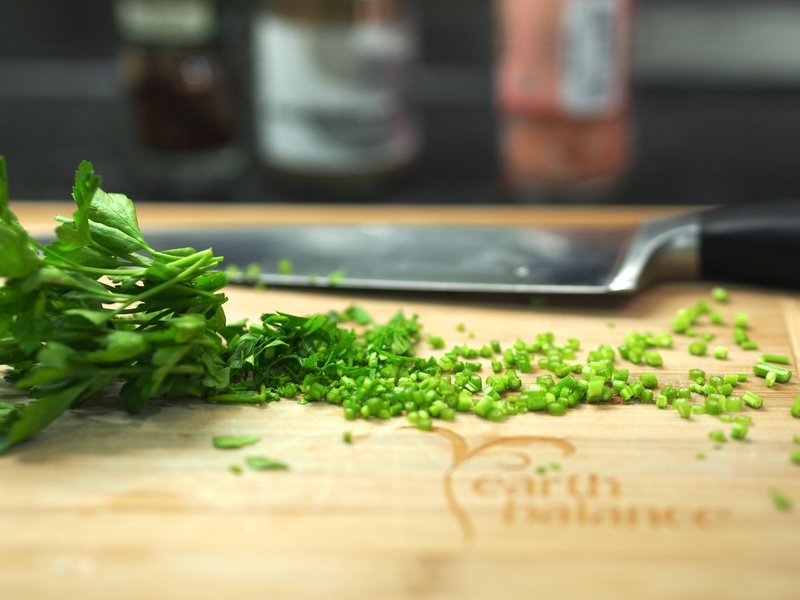 Evenly slice the garlic and finely chop up the parsley. 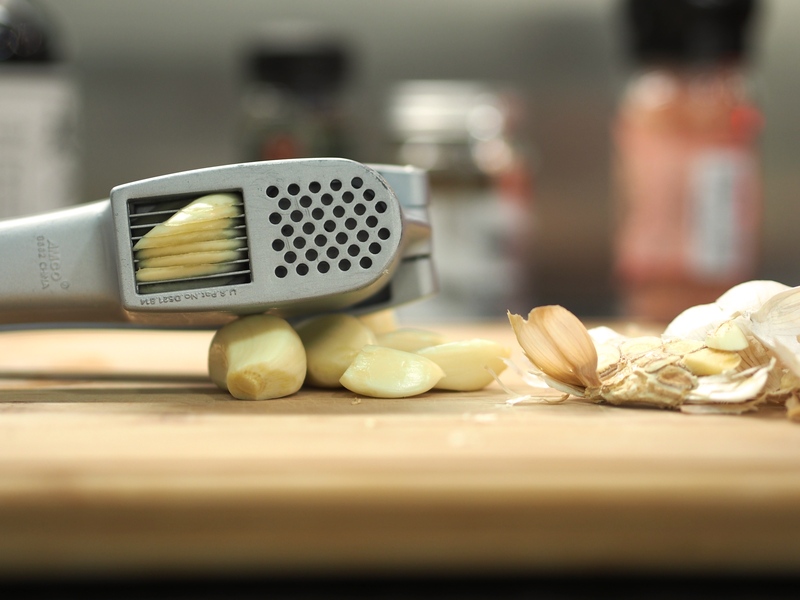 *I really recommend finding a dual-function garlic presser like this one (found at City’Super); when I hand sliced the garlic, the differences in thickness made some brown much faster than others. 3. 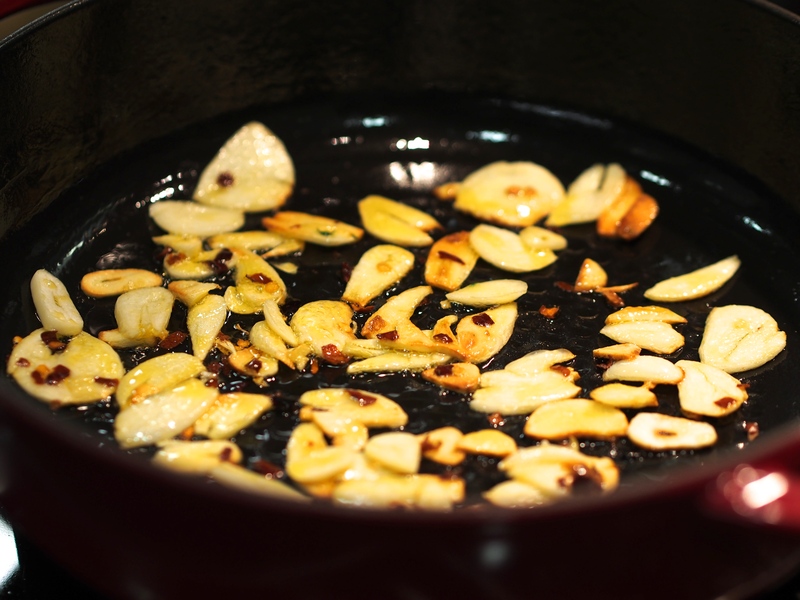 Add 1 tablespoon of olive oil, the garlic and chilli flakes and heat over medium heat for 2 minutes or until golden and fragrant. 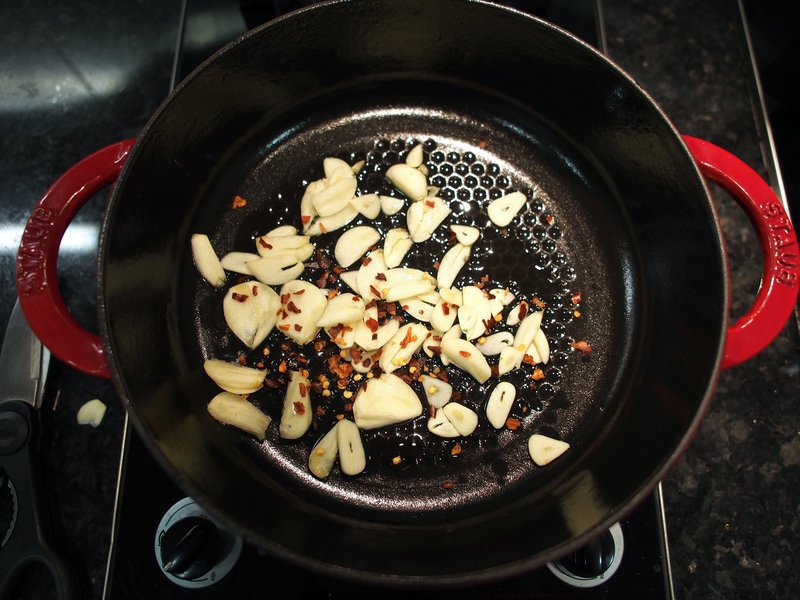 *Letting the garlic heat together with the oil allows it to become fully fragrant and evenly golden without burning. *It’s actually not good to use good quality extra virgin olive oil when cooking with high heat because these unrefined oils have a low smoking point and will become carcinogenic when heated beyond this temperature. So always have two types of oils ready in your house: regular olive oil for most cooking and extra virgin olive oil for delicate cooking or dressings. 4. Meanwhile, cook the pasta in salted water. 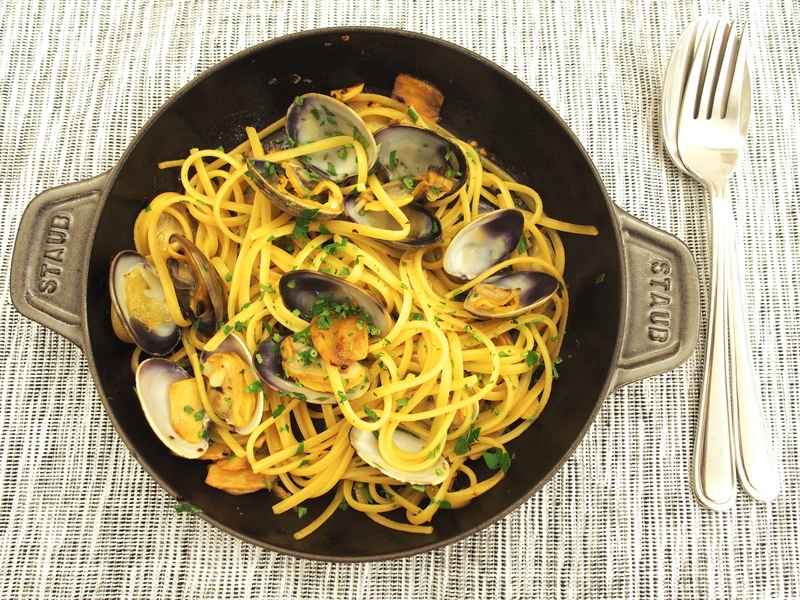 The pasta will be finished off in the clam sauce, so cook it for about 2 minutes less than stated on the package. 5. 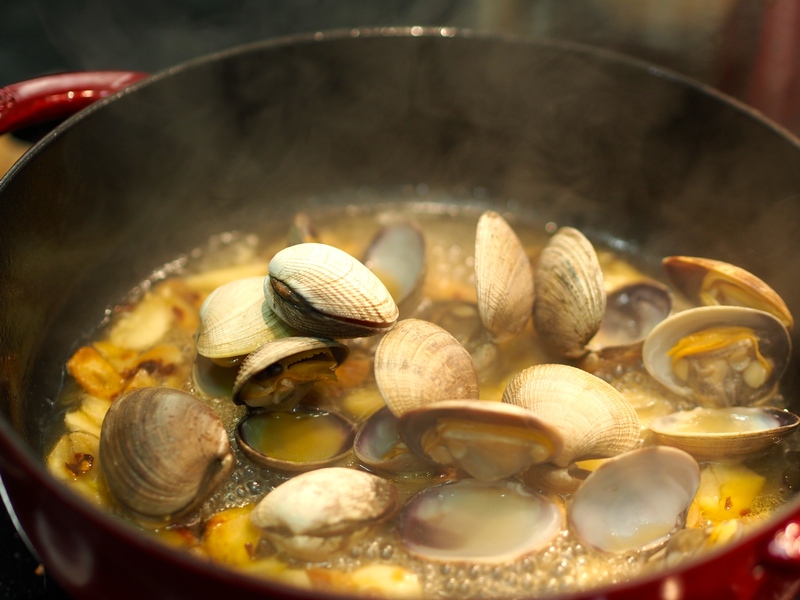 Add the sake and clams, toss and cover with lid to steam for 2-3 minutes or until the clam shells pop open 90 degrees, then remove to a separate bowl. Discard any unopened shells after giving it 5 minutes. 6. Taste and season the remaining clam sauce with salt and pepper. 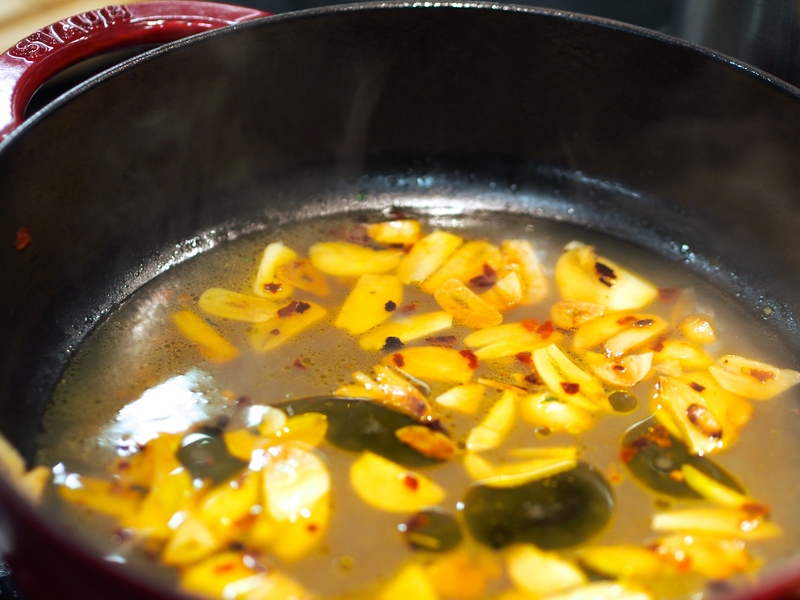 Add 1 tablespoon of extra virgin olive oil (this will make the pasta smooth). 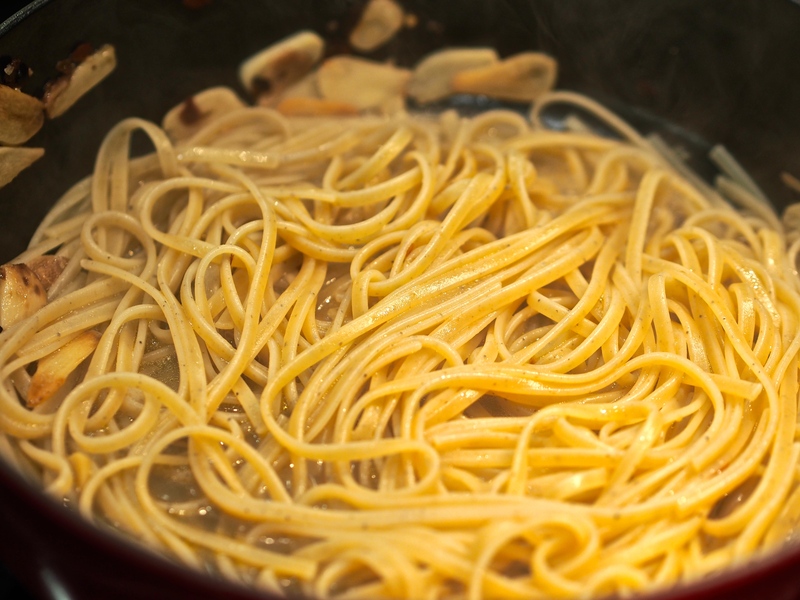 About now, the pasta should be about 80% al dente. Add to the clam sauce, along with some pasta cooking water. Toss and allow it to finish cooking and soak up the sauce for 1 minute or until al dente. 7. Finally add back the clams and parsley, toss, and remove from heat. Garnish with seaweed flakes! I hope you enjoy and please do share a photo with me if you ever make this or use #cookedforyoublog to share on Instagram! Stay in love with life … and happy as a clam! This looks to die for, and your photos are gorgeous!